The Wildlife Institute of India (WII) will study the impact of climate change on wildlife and devise strategies to lessen its effects on various species found in the state. A team of 11 scientists along with 22 project personnel from the institute reached the Bhagirathi Basin on October 1 as part of the National Mission for Sustaining the Himalayan Ecosystem (NMSHE). As part of the study, the team will focus on biodiversity conservation and protection of wildlife, traditional knowledge of societies and their livelihood. The media workshop on adaptation to climate change in the Indian Himalayas was organised by Centre for Environment Education & Third Pole as part of the Indian Himalayas Climate Adaptation programme and national mission for sustaining the Himalayas eco-system, to improve creative thinking and effective communication on adaptation to climate change in a local context. According to an International Centre for Integrated Mountain Development study, there are an estimated 54,000 individual glaciers in the Hindukush Himalayan region that are shrinking, thinning and retreating. Howfar is this figure accurate, given that there is very limited data available on the Himalayan glaciers? Gangtok: A team from Sikkim State Council of Science and Technology completed the field Expedition to East Rathong Glacier (6,678m-21,909ft) to carry out Glacier dynamics study for the ablation season of 2015. The team successfully completed the expedition on June 27. The team started the expedition on June 17 this year from last motor-able village Yoksam in West Sikkim. The State Council is engaged in the field based glaciological research of East Rathong Glacier since September 2012 under project entitled 'Study of Glacier dynamics of East Rathong Glacier, Sikkim Himalaya' in collaboration with Department of Science and Technology, Govt of India. Srinagar: Eight months on, reminiscences of last September’s deluge are still reverberating in the lives of many. Families in and around Srinagar city are yet to reconcile with the aftermath of the natural calamity that befell them early last autumn. A family in Srinagar’s posh locality, Jawahar Nagar, is yet to clear the muck in their two-storey house that was brought along, by the devastating floods that hit the Valley, especially Srinagar city, on 7 September last year. The deluge claimed around 300 lives and injured hundreds across the state apart from causing huge losses to property, which is estimated in trillions of rupees. Six months after: Will flood ravaged Kashmir learn? Gund-i-Jehangir and its neighbouring Naid Khai are the worst affected villages due to water logging since the 2014 floods. 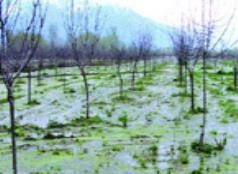 And these are just two of 123 such villages in Bandipora district that were ravaged by floods in September 2014, and hence declared "flood affected" by the administration. Most of these villages, and the apple/paddy fields, continue to be waterlogged even now. Srinagar lives on the water, as the city has done for as long as its history has been recorded. What makes its semi-amphibious nature unique is the city's location: in the Valley of Kashmir, itself some 1,600 metres above sea level, and surrounded by the nearer peaks of the loftiest mountain ranges in the world, the Western Himalaya, the Hindu Kush and the Karakoram. Sometime this month, Kulwant Singh's three-storey house was to be decked up with fairy lights for his daughterfs wedding. Instead, the 50-year-old father watches solemnly as masons rebuild his house, brick-by-brick. The businessmanfs home was reduced to rubble in the floods of September 2014. Srinagar/Bandipora: Kashmir is known for its delicious apples. Apple cultivation is the mainstay of Kashmir’s economy (along with tourism and handicrafts) with revenue of Rs.1,200 crore a year, according to the Associated Chambers of Commerce and Industry of India.